Yoshimura Mai was teased in middle school because of her looks so she gave herself a makeover before entering her new school. Now she has set out on a mission to change her life and the best way to do that is by finding a boyfriend. On her first day she bumps in to the perfect target and she starts to pursue him but she finds herself getting an unlikely rival. 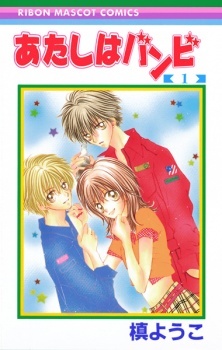 Atashi Wa Bambi is just your not so typical highschool life filled with jealousy and romance. The story was a bit surprising and it can kind of make you cry in the end. It's really cute though. I expected a love triangle. What I got was completely different. The characters are adorable and the heroine is not annoying like most. This would have been the typical shojo manga had it not been for Yaezou. His characters was essential for this manga to go above the shojo category. It's a struggle of accepting yourself and not being afraid to let others really see you. Mai, at first seems like your typical girl who underwent a makeover and targets Sen, an all around likable guy, but she isn't. She is sweet and strong. Her love for Sen is what starts this manga but that was just the beginning for her. Sen is ordinary and part of me wonders why she fell for him anyway. She barely knew him. Isn't love at first sight suppose to be mutual?l. He is this manga popular bishie. His character is a little on the cold side and it's partly because of his off air time. Yaezou is Sen's childhood friend. He loves him dearly and wants him to be happy. But he's also hiding something from him that could ruin their friendship. The manga is short and anything else would just be a spoiler so, JUST READ IT! At First, i didn't really want to read this manga because i think it's not original like the girl had a makeover and a handsome guy likes her and they live happily ever after! BUT When i started reading it, i can't let go of it anymore! It was really great! Try reading it and see for yourself. I didn't expect the story to express so much emotions. It was really unique for me... The story is really different from other mangas. I really liked how the story progresses. This Is So Amazing You Don't Even Know. This Is Defiantly Not Your Typical Manga, The Ending Is Defiantly Not What You Think. I Love All the Characters. Don't look At This And Say oh I Know How It Goes Because You Don't. What Makes Me Laugh about this is Once You Think You Know the Ending, The unexpected Happened. The Ending Is Sorta A Cliff Hanger But It Works With This Manga. And In The Middle You do Sorta Wanna Cry Of Sadness, pity And Un-believe-able-ness(Lol). And In The End You Want To Laugh (I Did) Or Cry Of OMG Are you Serious-ness (Depends On How You Take The Ending). I GIVE IT A 10 IN ALL SECTIONS!